It is no coincidence that more Alaskan guides use the Barney’s pack frame than any other pack. In fact, I’d be willing to bet that more animals have hitched a ride in a Barney’s pack out of the Alaskan backcountry in the past 25 years than in any other pack on the market. After hearing rave reviews from several friends and guides, I decided to buckle down and give the Barney’s pack a try. 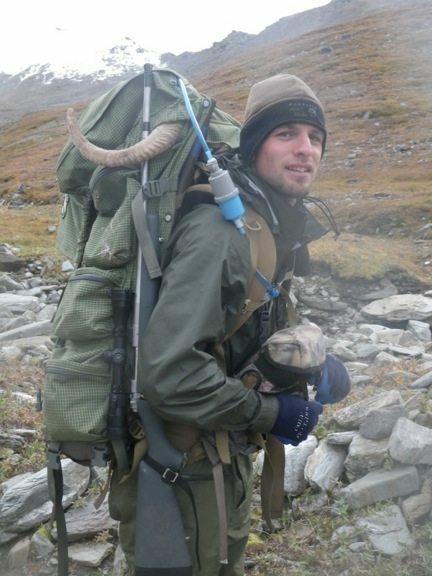 This past season, I ended up helping pack out three dall sheep, four caribou, and a wolf with my Barney’s pack. While I obviously can’t give an honest long-term report, I believe that the 40+ days and 200 miles I spent living out of this pack gave me a good feel for how it carries both normal weights (40-60 pounds) and extra-heavy (120 pound plus) loads. The Barney’s is an external frame backpack that can be used as a stand-alone frame to lash meat or gear to, or it can be used in conjunction with one of several different sized pack bags. The frame and pack bags are offered exclusively by Barney’s Sports Chalet in Anchorage, Alaska. While some may get some sticker shock looking at the price tag of the Barney’s, if you consider the price of other offerings from quality pack makers like Kifaru and Mystery Ranch, I think you would soon see that the pricing is right in line or cheaper than other options in the same class of pack. The pack frame comes with a top bar and meat shelf which some people prefer if using the frame by itself. Since I was using a Pinnacle pack bag in conjunction with the frame for my uses, I chose to save several ounces by removing the top bar and meat shelf. Doing this brought the weight of the external frame with the harness system and waistbelt down to approximately 4.5 pounds. The weight of the 7800 cu in Pinnacle pack bag is roughly 4 pounds. To ensure you don’t undertake a serious backcountry endeavor with a pack you end up hating, it is always a good practice to give any gear item a field test run or two prior to heading out. Before this past hunting season got into full swing, I chose to take this pack out on a couple hiking trips to get the fit dialed in and see how I liked it. It took a bit, but once I had the pack fitted to me, I really liked how it rode. Though I had only around 50 pounds max in it during the summer hikes, it was comfortable enough that I felt confident taking it into hunting season. The first hunt was a 10-day sheep/caribou combo hunt, and while we didn’t manage to bag a sheep on the trip, we did harvest a small bull caribou. 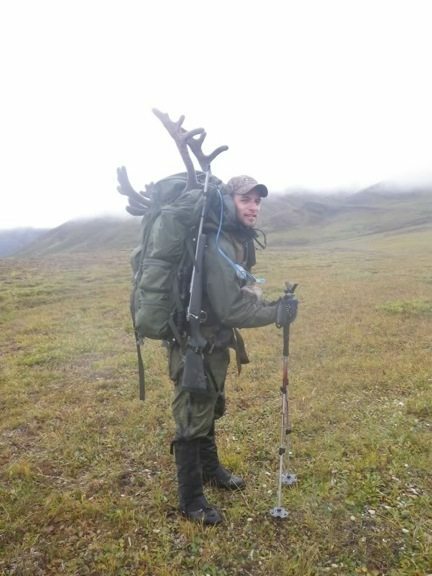 I was able to “comfortably” manage hauling the caribou, bone in, and a portion of camp back the five miles back to the truck. I use the term “comfortably” loosely here, as 120 pounds in any pack is never really comfortable per se. Perhaps it might be better to say the 120 pounds in the Barney’s pack sucked less than any other pack I had used previously at similar weights. Small bull caribou loaded up plus some camp gear in the Barney’s Pack for a 125 pound load. · The harness/suspension system: I truly believe this is the where the Barney’s frame leaves all other external frame packs in the dust. The shoulder straps are very well padded, which is especially nice as the pounds in the pack meet or exceed that triple digit mark. It was easy to adjust the weight to or from my hips even with heavy loads. · Pinnacle pack bag layout: Some people prefer to save some weight and have one giant pack bag while others would prefer a bunch of little pockets to organize everything. I find myself somewhere in the middle. A few pockets here and there that allow for some organization is appreciated, but for the most part keeping base pack weight down is a priority. The Barney’s Pinnacle bag has seemed to meet this balance fairly well. There is a pocket to fit a spotter and a tripod together on one side, and on the other side of the pack bag there are three pockets to fit quick access items like rain gear and headlamps. There are also a couple more pockets to fit a hydration bladder and other items. 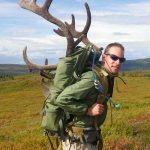 · Pack weight: While certainly not an ultra-light hunting pack, however, given the weight this pack is capable of hauling and the volume it has, it is very respectable that it weighs in at between 8-9 pounds. 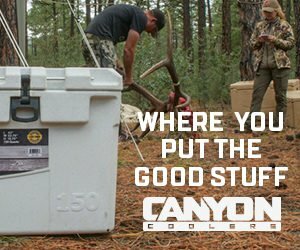 Some of the other hunting packs on the market that I have used come in at or over 10 pounds before you put any thing in them, and are usually a couple thousand cubic inches smaller, while still not carrying heavy loads nearly as well. · External Frame: This isn’t a dig against just the Barney’s frames only. There are a lot of positives to using external frames, especially when it comes to heavy hauling. However, at usual backpacking weights, say the typical 40-60 pounds going in on a 10-day backpack hunt, usually an internal frame will be sleeker through the brush and more comfortable to carry. · Compressibility: The cavernous 7800 cu in Pinnacle pack bag does have three compression straps going across the backside of the pack to help better manage the excess cubic inches when using the pack as a day hunt pack. However, using such a large pack bag when only filled with enough gear for day hunting out of a spike camp, I found that the load still had a bit more side to side slop than I would prefer. I have experience with similar sized packs that offer better compression systems for use when the bags aren’t full. As you can see in the picture below, even with a whole bone-in sheep and cape, plus day hunt gear, there is still a lot of excess space in the 7800 cu in pack. I appreciate the extra space when I need it, but I would like the ability to compress it a bit better when I don’t. · Waistbelt sizing: As I type this article in mid January I am just coming out of my annual “fat season.” At 5’9, my current weight is 165 pounds after taking a break from the workout scene during the holidays. By the time hunting season rolls around I am usually down to about 155 pounds. The waistbelt on the Barney’s pack goes small enough to work for me at the beginning of the hunting season, and even with large loads fits my 30-31″ waist. However, after my third dall sheep hunt last season I was down in the mid 140 pound range and the Barney’s waistbelt would seem to slide down on my 29″ waist even with the waistbelt bottomed out as small as it would go. Something to consider if you have a more slender build. As the season progressed, I became more and more impressed with how the Barney’s pack carried and how comfortable it was. I began to see why many of the guides in Alaska live in these packs their whole guiding season. They are very tough, large enough to carry high volume/bulky loads, and arguably the most comfortable pack on the planet when weight is in the triple digits. For anyone looking for a true heavy hauler that comes in at a respectable weight, with more than enough space to carry anything your knees can take, I’d look no further than the Barney’s pack frame with the Pinnacle bag.